This is where I’ll be tomorrow. With one very cool bicycle. This ain’t no Orville and Wilbur bike- but one that could change the way we think about getting around Dayton in much the same way as they changed the way we now get around the world. The Bcycle is a bike for a forward thinking community- one that realizes that filled parking lots aren’t near as interesting as full buildings. One that thinks that getting from point a to point b can be fun again under people power- instead of internal combustion. We can’t keep hauling a 2 ton carcass around with us everywhere we want to go- as gas will keep getting more expensive- and we keep getting fatter as a society. You don’t have to love bike share, but you have to love the idea of it. What it stands for- independence from the Sultans with their oil reserves- and the idea that we can make a difference one short trip at a time. The Bike Summit is about a lot more than bike sharing- but, bike sharing is the fastest way to “normalize” the bike- making it as common as cars. This year we hope to ignite this movement by providing the motivation and tools needed for local communities to become more bike and pedestrian friendly by holding the Miami Valley Cycling Summit on August 14, 2009. The Aug. 14 Miami Valley Cycling Summit, part of the Drive Less Live More campaign, is a call for action for those who are interested in transforming the region to a healthier, more vibrant community. via Miami Valley Cycling Summit. 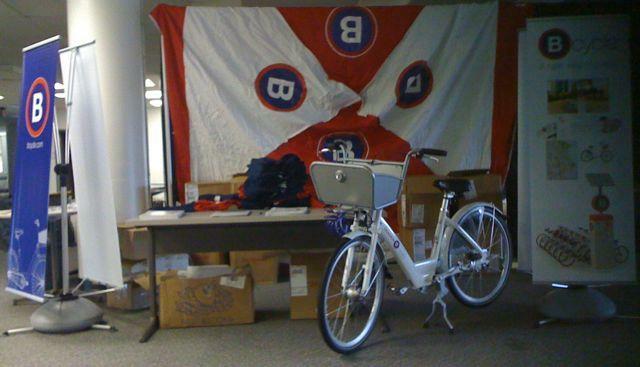 We’ll be at the BCycle booth- with the bike with the basket and the heavy duty center stand. Stop by- and see what the bike of the future looks like. The one that will put Dayton back on the map as a forward thinking community. Previous Post: Tearing down is not building up Dayton. Next Post: How bike unfriendly is the Dayton PD? I’m cheering you all on. I tried to use a bicycle for transportation when I was young. I gave it up for the most part after the third time a careless driver caused me to crash (the second time was a head-on collision). At this point I’m too old and tired to pedal, tho’ I will change my mind when there are dedicated bike lanes/paths that go where I need and when I can afford a proper 3 wheeler so I don’t fear falling and fracturing some of my old bones. You forgot the 5 Ws, mainly where and when. Yet another yuppie fad. Given the hot and humid summer climate and long commuting distances this is not a realstic option for basic transportation if one is working in an office environment. Given a choice between cycling to work in summer weather and driving in air conditioned comfort ‘ll choose the AC anyday, as would most sane people. I guess call me insane-I biked in today, as I do 3-4 times a week. This week, I crossed the 1,000 mile mark for the season (or as I like to think of it, 15,840,000 4-inch donuts end to end). Of course these are not all commuting miles. I do work in an office-wearing a suit, long sleeves and tie. A pannier (to carry my clothes on my bike), a shower, and a little planning lets it all work. Would an car with A/C be easier-yeah, but easier is not the only consideration. I chose where to live based, in part, on where I worked and where the bus routes were. Once I started biking instead of bussing, the location was still convenient. (I live about 51,500 donuts from work-one way.) But every bike ride instead of a car trip helps-helps my body, helps my mind, helps the environment, helps the oil situation. My bike will never totally replace my vehicle-I totally love my Escape, “Houdini”. But by valuing biking, one can choose where to live in relation to work and shopping and entertainment options. And biking and a backpack can take the place of many short car trips. As we get better at sharing the road with cars and bikes-and motorcycles and electic vehicles, we can help change our society and environment. Consider the change in societal mindset about drinking and driving, smoking in public, or plastic shopping bags. Gradually, each is moving from ubiqutous to acceptance to questionable to tolerated to unpopular. We will totally never eliminate any of them and I don’t think we should aim to (well, maybe drinking and driving), but we can make each of them less common and help all of our ourselves. Bike where you can, when you can. Share the road with a bikeer when you are driving. Every ride makes a difference. @Dad- there was a link to Summit site- that had all that info. I’m glad you and Mom walked down and visited. @Jeff- this wasn’t all about bike share- or bike commuting- it was about making our community more bike friendly. An amazing statistic- while most of us rode bikes to school- less than 15% of kids do these days. There are things we can do to make walkable and bikeable communities possible- that was a big part of the discussion. It was great meeting so many cyclists today- and the reception the Bcycle and the idea of bike share got. We have a shot at being a pioneer in the adaptation of this. The cost is a lot less than the stupid 5 rivers fountains- and would impact our area in so many positive ways. Truddick- thanks for your support. There will be more coming on this- including some video. Sexist as hell- but pretty women on bikes around the world make the world go round. Next year. We could be on the same news cycle on this- although, bcycle is a much more advanced system.